Once we decided to homeschool our daughters for this school year, my husband got busy converting the playroom to a combination playroom/schoolroom. We agreed to our ten-year-old daughter’s request to paint the room blue. The bookshelves and other furniture was rearranged in an attempt to create two separate workstations. 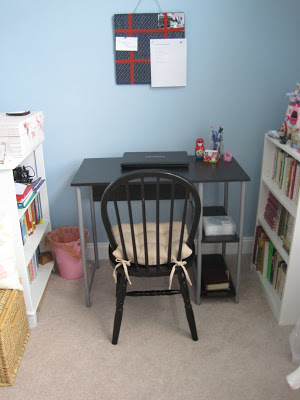 We bought inexpensive desks from Walmart and put up two memo boards that our girls made in Vacation Bible School this summer. My husband then put together a white board and hung it on the wall. While shopping at TJ Maxx last week, I found some new curtain panels at an excellent price. I’m now in the process of looking for different desk chairs. The ones we’re using belong at the snack table in the living area, but they’re working for now. I like this new space so much that I almost wish I could go back to school! Since they’ll be spending a great deal of time in that room, I’m glad the girls like it as well. What a great school room! I like the paint color, too. I have always been partial to blue. It's calming to me. Very nice! I like how each girl has her own desk and bookshelf; like you said, each one has her own work space. I like it! I'm going to keep your design in mind for when we have a house with a room that we can use for school (and play!). I did try to make sure there was still open space on the floor for them to spread out their paper dolls, Legos (in pink, of course :), etc. 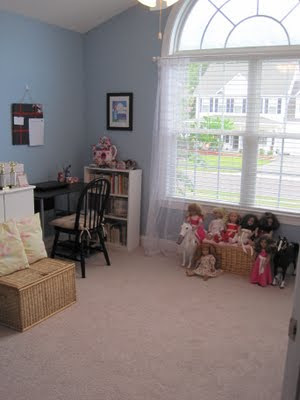 Since the girls share a bedroom, this room is still the best place for them to play. Combining it with the school room is working for now. Beautiful space! We just adapted our dining room into a school room last week, and I love it too. Good luck with the homeschooling! You did a great job on the room. I like that you used the paint choice of your daughter, they love the feeling that their advice was taken. She'll look at those walls a lot, you just made it more special. I loved having a school room, it kept the kids a little more focused on their work.